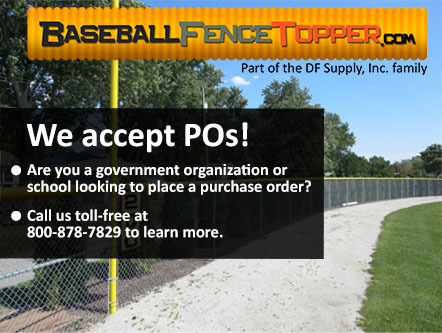 If you a government entity or a school and you are looking to purchase baseball fence topper you have found the right company. We offer all our products to the government, cities, counties, states… at the best price possible. We know you are looking out for your budgets, and we are here to help you keep your budget. We have over 50,000 happy customers, and would love the chance to earn your business. We accept PO’s from most government entities. Please call (800) 878-7829, fax (330) 650-9004, or email sales@baseballfencetopper.com for a price quote on our fence topper, Saf-T-Fence outfield fencing, or any of our baseball fence accessories. We offer net/30 to all government agencies and schools.